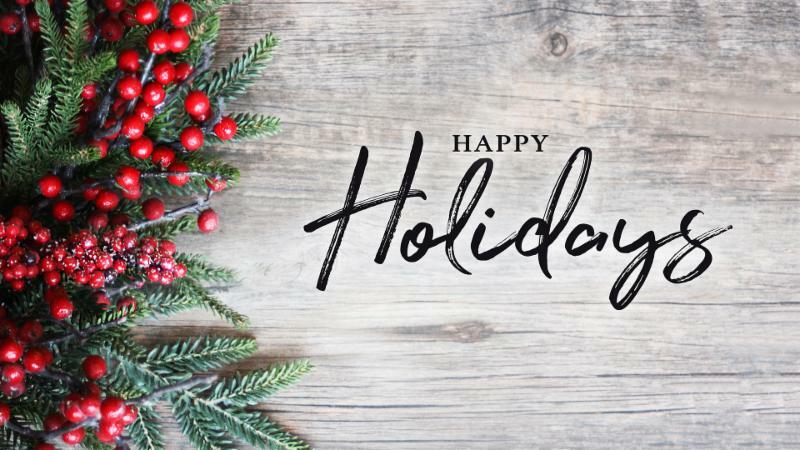 Student Earns GED, Family Lit Wrap Up, Holiday Potluck Date, and More! 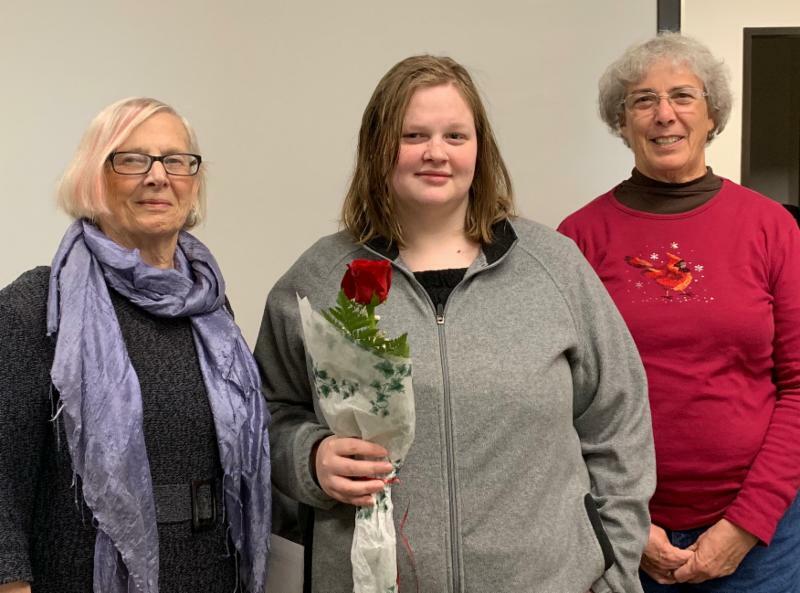 Emily came to Reading Connections with a goal of earning her GED so that she could find a better job. ABE Coordinator Kiara Coulman matched her with a team of tutors which included Elizabeth Chiseri-Strater for reading, David Marlin for math, and Pat McKinney and Candy Lemon for social studies/science instruction. Emily showed her determination and perseverance by methodically improving her writing skills, learning more about algebraic expressions, and attending classes for a total of 205.5 hours. We are happy to report that Emily achieved her goal! She is now seeking a full-time position and would love to get paid to work with animals. If you would like to volunteer to support students like Emily reach their goals, please contact us or visit our website for more information. We are so thankful for all of our volunteers and supporters who have donated their time and talent this year! 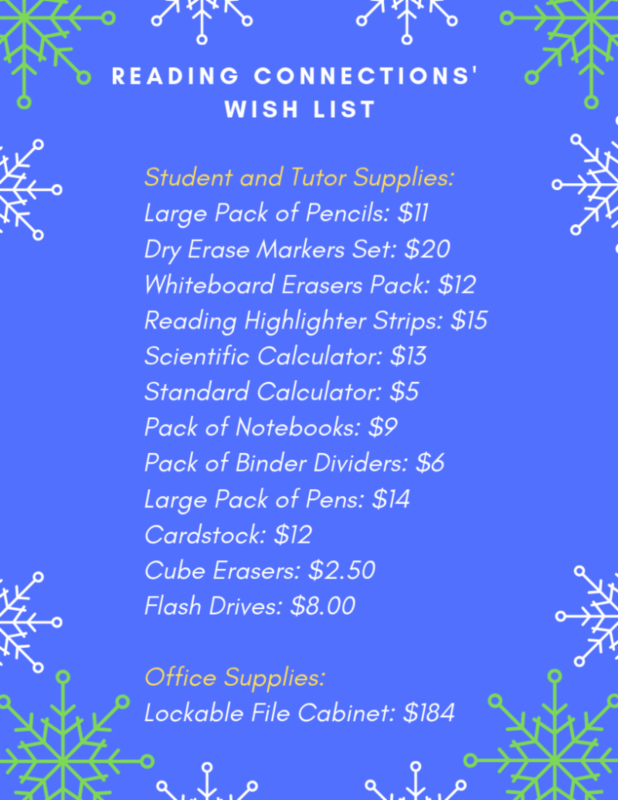 We have provided a wish list for those who want to donate before the end of the year. Simply click here to make a donation, and in the designation box, you can indicate which item you want your gift to cover. If you prefer, you can also send a check to our office and indicate which item you would like us to purchase. Thank you for your continued support! 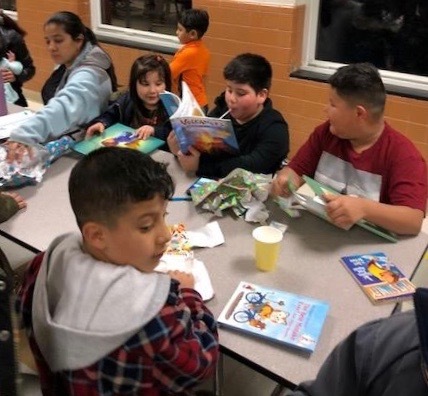 On November 20, families, instructors, and volunteers who participated in the Rankin Elementary Family Literacy Program came together to celebrate a successful conclusion to the 10-week program. As a testament to their hard work and commitment, parents received certificates of completion, and children unwrapped books and school supplies to take home and enjoy as a family. Both parents and children had positive experiences with the program. One parent, Victoria, shared that she enjoyed the activities she and her children completed as a family during Parent and Child Together (PACT) time each evening. She also commented that the program benefited her children by providing them an opportunity to interact with other children, and that during their time in the program, both she and her children were able to make new friends and work together to improve their English. Ann Mills has been a tutor with Reading Connections since 2011. Ann is a generous and caring tutor who has been working with her student John for over 7 years. They have become great friends and she loves that they teach each other new things each week. John is a diligent student and loves all of the stories that he reads with Ann. He has never missed a class and is always excited to learn. 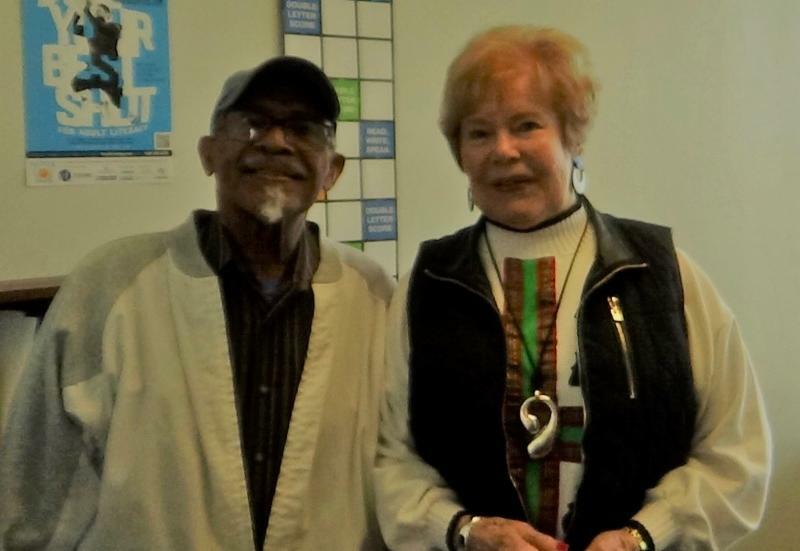 When looking back on his time working with Ann, he can’t single out a favorite memory. He said that they all stand out because he learns something new each time. 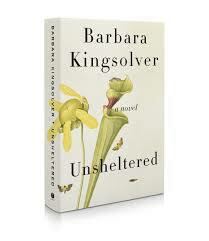 There are so many reasons to read books by author Barbara Kingsolver, but her latest book, Unsheltered , is a phenomenal read. The author showcases two different families (and their relationships) who live in the same house, but in different centuries. The families’ financial struggles and problems were the source of much angst and uncertainty. Click here to read the rest of Anna's review. 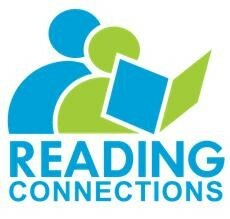 If you have a book review that you'd like to share with our Reading Connections' community, please submit it to info@readingconnections.org . Crystal Parks is not new to Reading Connections. She worked as an intern this fall and after her graduation this December, she joined our staff as the ABE Program Assistant. "I can't wait to take on more responsibility as a staff member," said Crystal. "This is a great opportunity to gain more knowledge!" 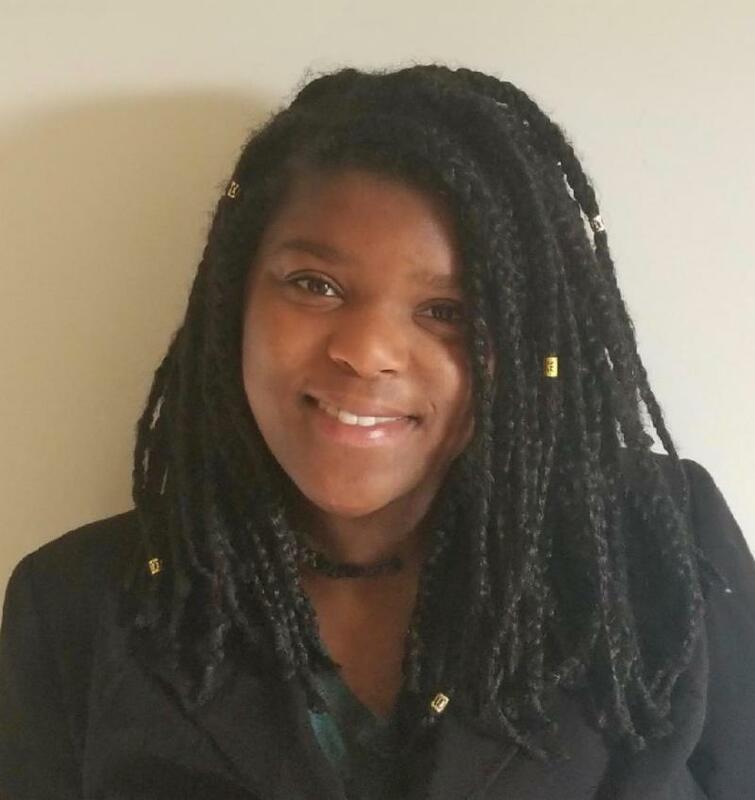 Takesha Wright joins us as an AmeriCorps member. She lives in Winston-Salem where she is a student and works at a family shelter. 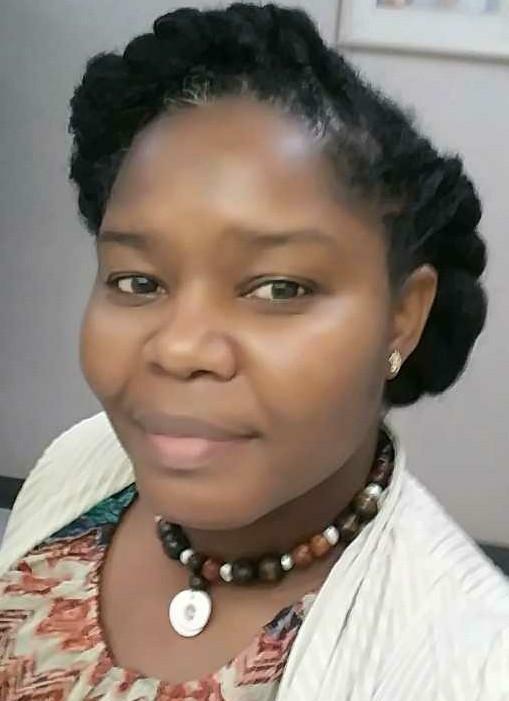 Takesha's interest in education led her to Reading Connections. "I enjoy helping others and believe one of the best ways to help improve someone’s life is by teaching them new skills." Please feel free to leave a message on our voicemail or send an email. Staff will respond to your messages as soon as possible. 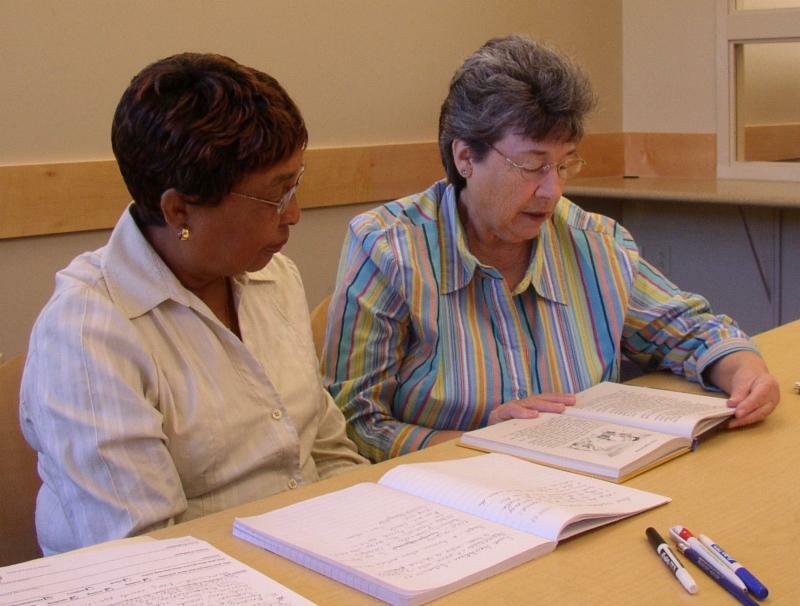 We are looking for dedicated volunteers to work with adult learners in Greensboro and High Point. If you are available two to four hours a week and have a passion for supporting adults in improving their literacy, please join us for our next free, three-part tutor training. 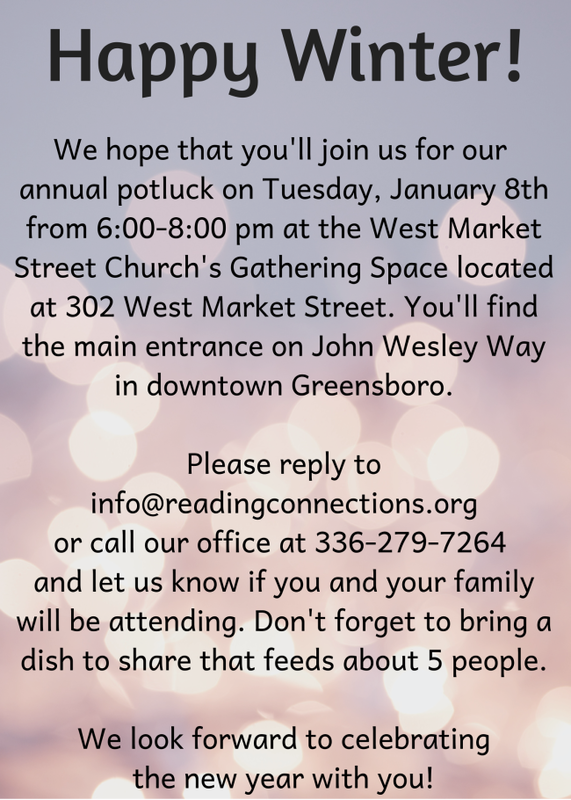 Anyone interested can call (336) 230-2223 or email us for more information. Please visit our website to read our tutor job description and find out more about tutor requirements.